Most projects have deadlines, some tighter than others. Then there are those projects where time is of the essence, where there is no room to breathe; if you don’t act now your window of opportunity will be closed. When I say opportunity, it is not about BrandQuery (although this campaign was a great one for us). What I mean to say is we had to change people’s perception now and if we did not act so quickly, it would be a much more difficult task and a longer recovery than some businesses might be able to withstand. Under normal circumstances, this project was a reasonable task for us. However, given the timeline, we knew we needed to bring in help. We put together a team of specialists. BrandQuery would lead creative, overall project direction, management and coordination. We brought in Strategies 360 to help us with media relations and social media, HandCrank Films (we have successfully produced several projects with them) to work with us on the commercials and Strategic Media Alignment to work with us on the media buys. The campaign began June 14th running through to July 5th, 2013. On June 3rd we were selected for the work. The same day we had a client meeting at 4pm. We coordinated and brainstormed with everyone between that time and 2pm on Wednesday. At 2pm Wednesday we presented to the panel. They had requested two creative concepts and an overview in how we were going to handle media relations, social media and our ad buys. After a long meeting, we were off and running. On Thursday at 6am, we began filming what would become four commercials – a :30, :15 and two :05’s. We shot the entire day without a break and were done at 8:30pm. We shot in nine of our desired 10 locations, setting up and breaking down in each, then moving quickly to the next. By Saturday we viewed the first cut, and by Monday had implemented edits to get the first spot where it was ready to present, which we did Monday afternoon. It was well received and without changes. In the meantime, we were developing our strategies for working with the Department of Transportation (DOT), the news media and our approach to social media. We also created an ever-evolving plan for ad placement. Timing in everything we did was essential; it was important to get local people moving and spending again. Since social media is immediate we went to work right away, first focusing locally and then reaching out to the metro areas of Seattle and Vancouver. Our messaging not only focused on how to get around but how to help local business owners – as we all know, people love to help, and they did. Stories were printed of local business owners who gave employees bonuses to spend locally. Locals and visitors alike tried locally owned restaurants when they might have otherwise frequented franchises. In regards to news media, several articles were written that focused on the efforts to get a temporary span in place in addition to helping people understand the economic impact to area businesses. We were very strategic regarding ad placement. Since it was the beginning of summer, everyone was more interested in getting outside rather than staying in and watching TV, we determined focusing our spots around the morning, afternoon, evening and late night news would garner the greatest exposure. We positioned our radio spots that same way in Canada, in addition to running :10’s during helicopter traffic reporting. The television campaign reached 9-million people at a frequency of roughly four spots per person, while radio reached just under 4-million at a frequency of nearly five spots. Earned media saw 22 articles published on the opening of the temporary span, the majority within the target markets. The Visit Northwest Washington Facebook Page saw an impressive 183.65% increase in Likes with Facebook Advertising yielding over 850,000 impressions at a click-through-rate of 0.472 percent, well over the 0.05 to 0.1 percent average. As a result of the campaign, many – including City of Burlington Mayor Steve Sexton – attributed the quick return of business to the marketing campaign. 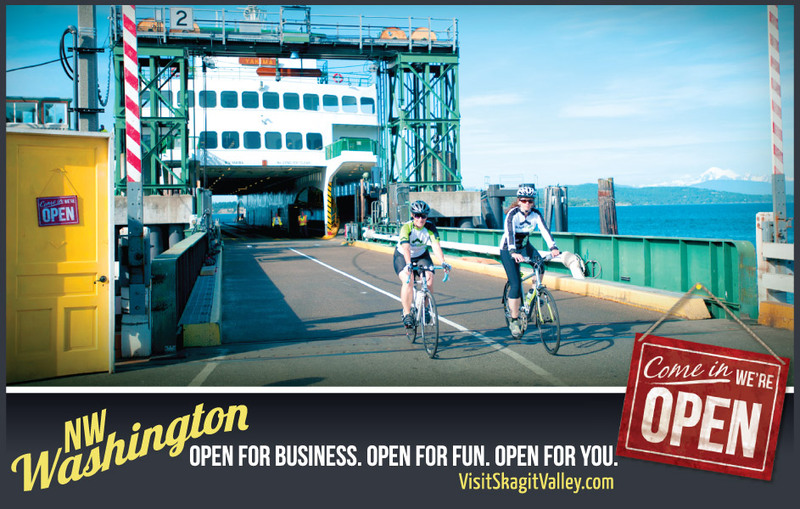 Skagit Valley Herald reported (I-5 Bridge Outage had Mixed Effects on Business, August 27, 2013) that despite the bridge closure, “Mount Vernon alone saw a 15.7 percent jump in taxable retail sales in June of this year over last year.” The article’s feature photo was the “Come in, We’re OPEN” door from the TV spot. And, the yellow door with it’s iconic sign lives on. You’ll see it at Skagit County businesses, and scenic locations in and around Skagit County – it has taken on a life of its own. BrandQuery was contracted to develop a regional marketing campaign promoting Northwest Washington. The resulting campaign features beautiful settings and unique businesses serving this region. Locations include a scenic downtown, Washington State ferries, a bakery and a farm stand to name a few. To help emphasize the message of drawing shoppers and visitors to the region, a bright yellow door with the iconic sign “Come in, We’re OPEN” highlights each scene that was filmed for the television commercial. The treatment embodies the area’s beauty, vibrancy and welcoming atmosphere while highlighting its valuable commerce to the region, state and country. The Visit Northwest Washington campaign focuses on counties throughout Northwest Washington, including Island County, San Juan County, Skagit County, Snohomish County and Whatcom County. In addition to the television spots embedded above, the campaign includes an emphasis on public relations, social media, graphic design and much more. The social media campaign focused on a concerted effort between EDASC and various Chambers in the region with teams from BrandQuery and partner firm Strategies 360 at the helm to strategically grow awareness of and promote business and tourism in Northwest Washington. For the duration of the campaign, strategic themes were created to generate interest in the Visit Northwest Washington campaign. 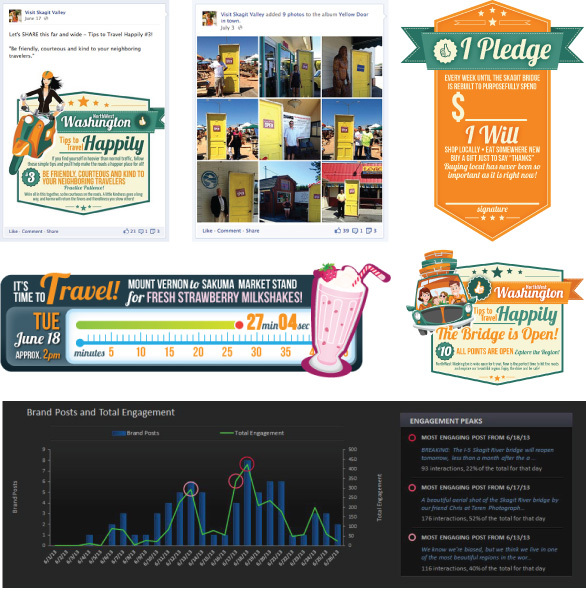 Graphic elements were created and paired with themes such as Travel Tips for happy, safe driving; an “I Pledge” button for supporting local businesses; and Travel Times for commuters traveling between Mount Vernon and Burlington. The Visit Northwest Washington Facebook Page saw an impressive 183.65% increase – from 801 (June 11) to 2,272 (June 21) – in Likes with Facebook Advertising yielding over 850,000 impressions at a click-through-rate of 0.472 percent, well over the 0.05 to 0.1 percent average.